Tethered panels are connected to a computer workstation by a cable. They rest in a bucky tray and are movable between the table and the chest stand, allowing a full-service X-ray room to get by with just one. Cables are typically around 45 feet long and will not limit the studies you can perform. Wireless panels communicate with their workstation with no cables whatsoever. They are powered by rechargeable batteries. They are also movable between table and bucky with the added convenience of no cables to manage or avoid. A single wireless panel can suffice for a full-service room as well. 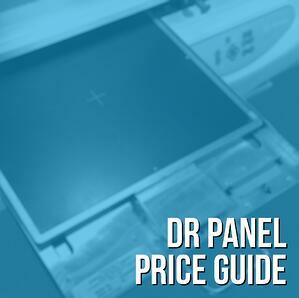 There are a few factors that affect where a panel will fall within its size range. First and foremost is whether it uses cesium iodide (CsI) or gadolinium oxysulfide (Gadox) as its scintillator. CsI affords the user better image resolution and the patient a lower dose. Neither of these are dramatic advantages over a Gadox panel, but they are, nonetheless, advantages that place CsI panels toward the higher end of each range. Features of different panels also vary from manufacturer to manufacturer. Some panels use auto-trigger while others use automatic exposure detection. Some panels have built-in handles while others need a case for a handle. Some panels have fixed batteries while others are removable. Some panels can sync with the pre-set protocols of any room in seconds, via NFC technology. The list of options goes on and, the more feature-rich a panel is, the more likely it is to reside on the higher end of its respective price range. The principles of buying in "bulk" apply here as well. If you're looking at outfitting your X-ray room with two panels, most providers will lower the price of each. The same is true if you're buying other equipment from the same provider at the same time ( a PACS system or a portable X-ray for example). Installation and delivery also play a small role in determining price. 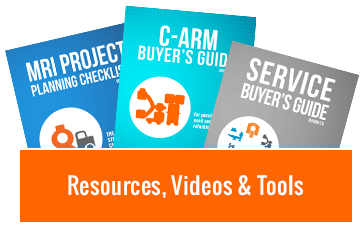 Wall-mounting for monitors, modifications to the chest stand bucky tray, and expediting all have potential to add to your costs. If you want to go fully digital but don't want to replace your entire X-ray room, DR panels provide the advantages you're looking for at a fraction of the price. We're ready to help you make the best pick for your facility's needs. Contact us to get the conversation started with a price quote or an on-site panel demo at your facility. Tim Mustapha is the Product Manager for X-Ray Equipment at Block Imaging. Along with product knowledge and industry insight, he strives to bring his passion for building working relationships to every project he’s part of. When he’s not helping people make great equipment decisions, Tim loves spending time with his wife and 5 children, playing sports, and geeking out on Star Wars.